In 2016 we will head to the northwest region and base our event in Woodstock and Harrisonburg for our 6-day tour. If you’re looking for a fun adventure by bicycle, mark your calendar now for June 24–29, 2016. We’ll host you for 6 days of exploration, relaxation, and camaraderie. Read more below. Look for lots of options and riding to suit any level of rider. Our riders loved the 6 day format. We kick off the next annual event on Friday, June 24, 2016 . We wrap up on Wednesday, June 29, 2016. We offer 6 days of unique bike routes with only two camp locations. You’ll have more time to relax and enjoy leisurely evenings and mornings without having to pack up your camp. 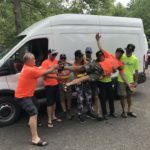 Some bike tours like Ride the Rockies, Cycle Oregon, Bike Florida, and GOBA move 5 or more times in a week. Our riders said they enjoyed more time at each camp, we listened and have built our event around this concept. Two host town locations and 6 days of route choices gives lots of great riding without the hassle of everyday moves. Our main route (the Pink Route) is between 45-65 miles each day average. Every day we will have different route options, varying from 20 miles up to 100 miles! Choose based on your preferences for distance, the sights, terrain, and points of interest. The rating for 2016 is expected to be anywhere from 4 to 9 on a scale of 1–10, where 1 is the least difficult and 10 is the most difficult. This should accommodate both recreational and advanced riders. The difficulty rating will vary daily based on which route option you choose. After we finalize riding plans during our Preview Ride in late April, we will assign a difficulty rating to each day of the tour. Route difficulty is rated on a 1-10 scale and is determined by elevation gain (climbing), distance of route, and experience. We will be publishing individual route difficulty for each day as we near the event. Those ratings will be printed in your tour guide that you receive at registration check-in. As spring draws near we are getting closer to finalizing all of our routes for June. Several things are coming together such as our rest stops, permits and various other elements that go into planning roughly 400 miles of riding. 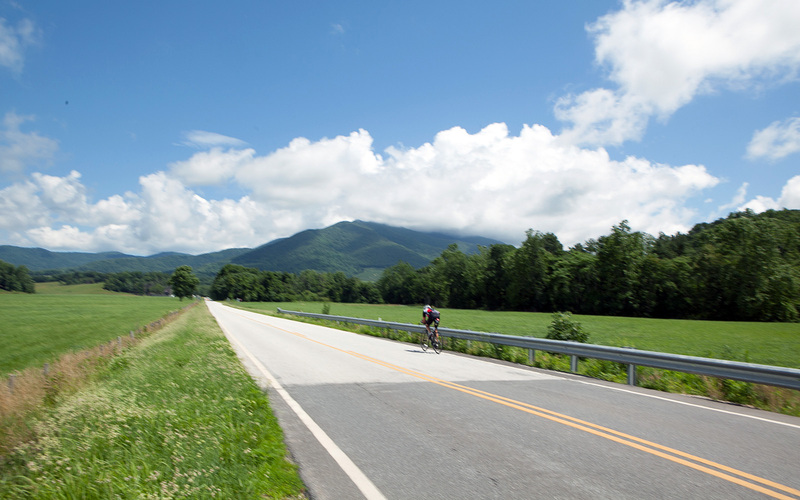 We are getting great local support and advice that is making this year’s routes some of the best we’ve seen in the history of Bike Virginia! Below you will find the latest info we have on the routes for each day. Keep riding and have fun doing it! Boom, like fireworks on the 4th of July, Saturday kicks off the main course for Bike Virginia 2016! Whether you want to ride a short ride or something a little longer Saturday will surely get you going. As you leave Headquarters you will quickly find yourself on backcountry roads within the first mile. 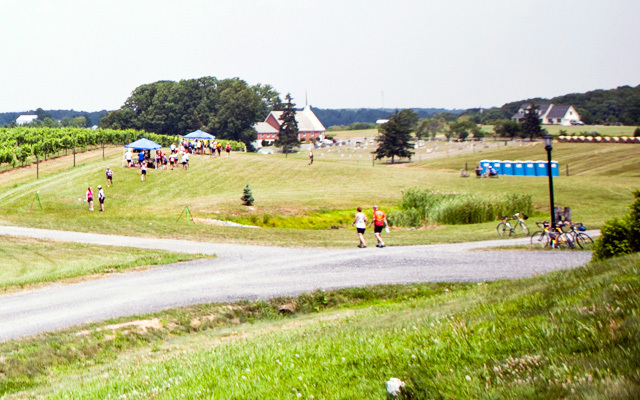 The town of Strasburg hosts our first rest stop and they are rolling out the red carpet for you, the only decision you need to make that day is whether to extend your ride up to 100 miles, stick to the main route of 54 miles or head back with our red 33 mile option…the great thing is that you can’t go wrong with either route! Choose wisely today, as there are 4 route choices, each with their own awesomeness. 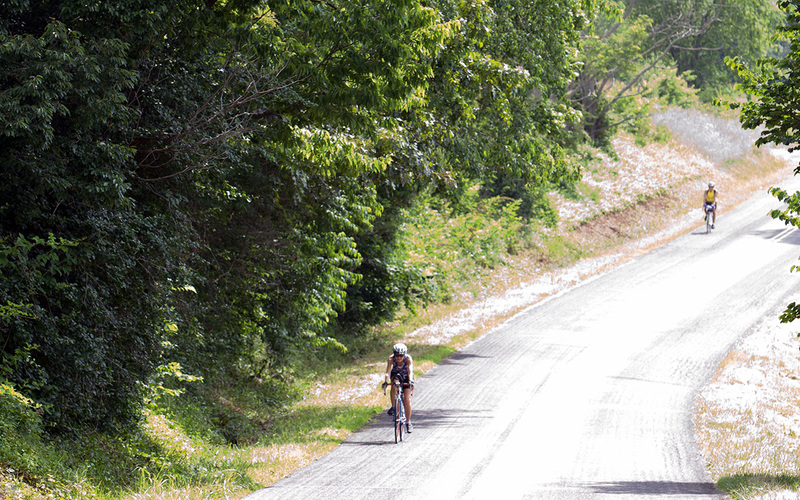 The red route will take you for a delightful 15-mile ride before returning you back to camp. Choose the Blue route and you will head out to the first rest stop and then make your way back to camp; both the Red and Blue routes miss the big climb of the day. 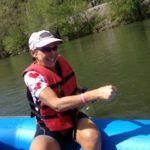 Following the Pink route will take you on a great ride that will almost have you seeing West Virginia as you follow lovely back roads. 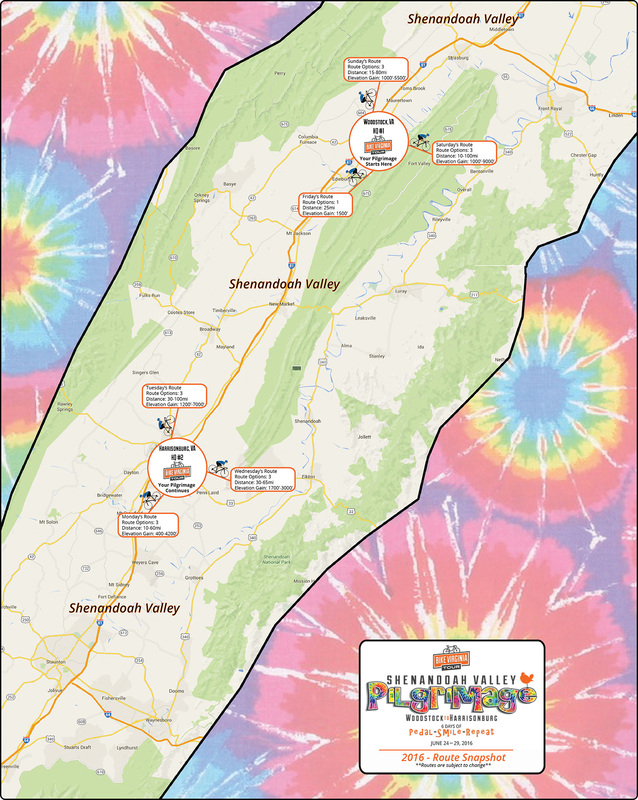 If you are feeling your breakfast then hit the Orange route option at the first stop and spend a little more time soaking up the peaceful bliss of the Shenandoah Valley. Whichever route you choose, don’t forget to check out the Virginia “LOVE” letters that will be on display at the Historic Courthouse in downtown Woodstock on your way back to camp. Move day! This is when you will pack everything up and head over to our next location of Harrisonburg. Home of James Madison University (JMU) Harrisonburg is full of wonderful things to do and they have a great cycling culture that is full of some of the best riders and riding in the state. Once you get settled into the new location you will hop on the bike and head back into the valley. Watch out for Amish buggies as you travel through beautiful towns such as Bridgewater, Staunton and even the small hamlet of Stokesville which sits just on the boarder of the George Washington National Forest (make sure to take a dip in the swimming hole at the rest stop). As you get back into Harrisonburg settle in and relax as you take in your new surroundings. We want you to enjoy the last day of the tour and we feel Wednesday will be one for the record books. 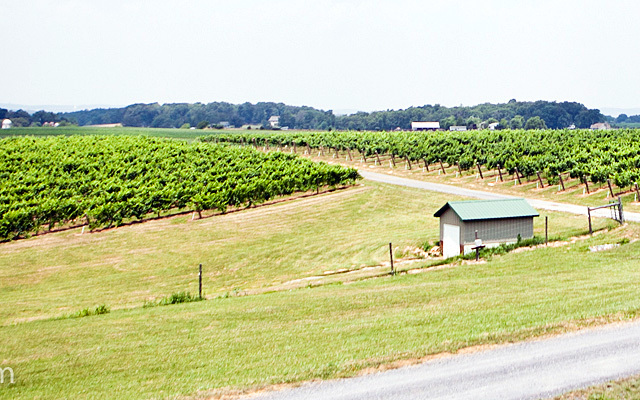 Rest stops at Cross Keys Winery and the Grand Caverns. The caverns was discovered in 1804 by Bernard Weyer while trying to retrieve one of his traps. Weyers Cave opened for tours in 1806, making it the oldest continually operating show cave in the U.S. Just one among the many things you will remember about the last day. 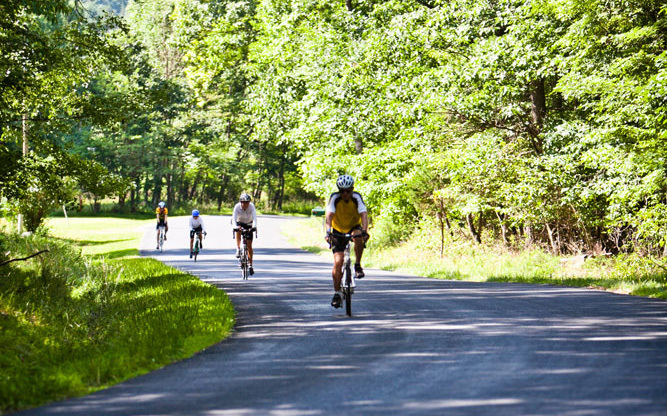 These wonderful stops are linked with beautiful valley riding only the Shenandoah can offer. Relax as you meander your way back to camp because once you are back you will be treated to a great “You Did It” Celebration to cap off your perfect week of riding!